This maybe of use to some people. And type - http://www.itopfield.com.au into the search bar. 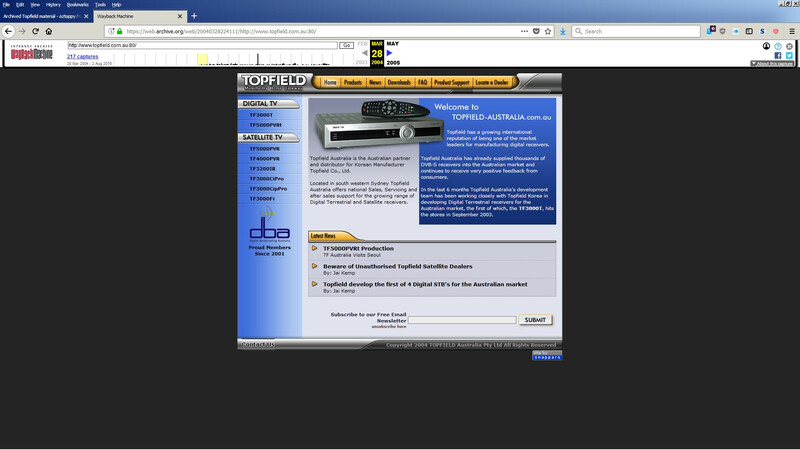 You can browse the old Topfield site and download firmware, manuals, brochures & utilities etc. It has several snapshots ranging from 2007 to 2018 although post 2016 entries don't work to well. The firmware entries generally have the fix list as well. Using topfield.com.au goes even further back. Interesting, so I tried it and got it to work after a couple of goes. James thanks for this information, I will check it out - information of changes will help a lot. The Wayback Machine at the Internet Archive is a very useful resource for websites that no longer exist. It cannot save active content, but it is surprising what can be found there.